TAD’s Hunter Volunteer Group has designed a custom project which allows Dorise a young lady with Cerebral Palsy, to play the game she loves, Boccia. Boccia is a precision ball sport similar to bowls, it’s designed to be played by athletes with a physical disability. Dorise has no movement in her body but she is able to move her head and use a pointer to help her with some tasks. The Boccia competition rules allow Dorise to use her head pointer and some assistive technology to play. TAD’s volunteers enjoy working on Unique Solutions to help people living with a disability achieve their goals and improve their quality of life. After meeting Dorise, the Hunter volunteers got together to create a project to assist Dorise with her game. The volunteers began with a ramp that could hold the Boccia ball and enable a smooth bowling action. They customised the ramp so that it is just the right height for Dorise to be able to bowl using her head pointer when the ball is at the top of the slide. This works well for fast bowling as the height creates a lot of momentum. However, to play a great game Dorise needed to be able to bowl a slow ball too so the Hunter volunteers came up with a solution for that as well. To slow the ball down it needed to be released from a lesser height. Unfortunately, that meant the ball would be too low for Dorise to reach with her head pointer. 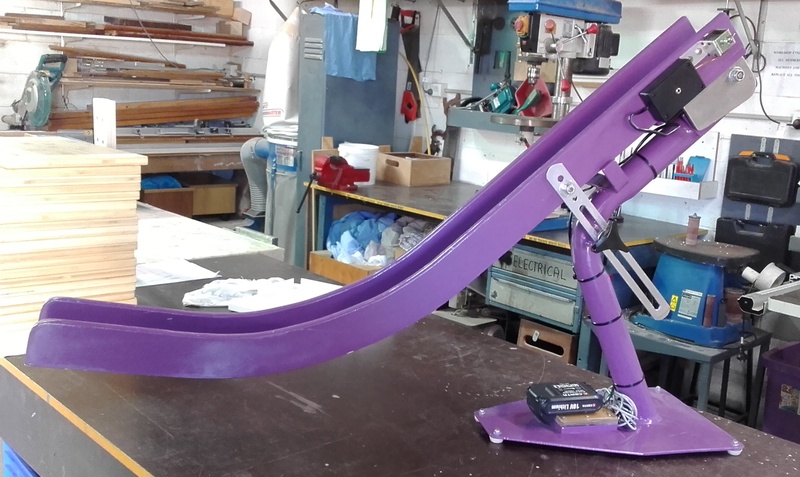 The volunteers came up with a smart solution, they fashioned a mount at the ramp’s half height and used a solenoid switch to trigger the ball release. They placed a button on Dorise’s wheelchair so that she can activate the switch using her cheek. The electrical circuit is powered by a rechargeable battery commonly used for power tools. The Boccia ramp was nominated for the Project of the Year Award at TAD’s annual Volunteer Conference held in November 2017.